Since Will and Sophia, 2 of my 4 upcoming candidates for the upcoming IDC, starting 29th November, will be leaving to the cold UK for the holiday season, so we decided to get a few courses done and out of the way before the IDC starts. Next week they will be participating in the DAN O2 provider course. Here's Sophia practicing the log roll on Will. They also practised skills like Scene Assessment, Rescue breathing, CPR amongst others. One of the skills they also got trained in is the correct use of an AED or Automated External defibrillators. 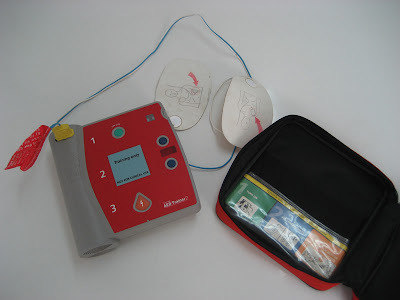 This is a picture of our training purpose AED. 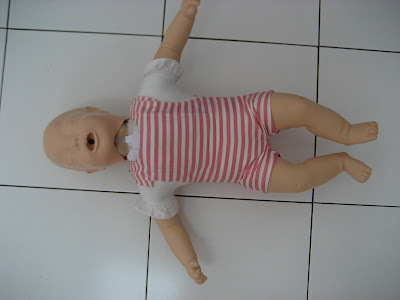 Training on infants and children is also included in the Instructor course. Here's a shot of Baby Anne in full pose. After completion of the course we had the a group picture taken in front of the local recompression chamber and they received a short introduction to the Chamber and the way it works, which they found very impressive and informative.